In November 2018, the Bank of Asia will celebrate its 20th anniversary. Thereby, we are pleased to introduce all our customers to a new product - "Jubilee Card". The "Jubilee Card" is an Elkart card specially designed for this date, which will not only allow you to manage your money in a qualitative way, but also receive a pleasant bonus in the form of a 7% deposit to the balance of your cash amount on the card. Due to this, your money will "work" for you and bring you an additional monthly income. 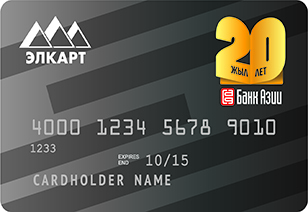 Now you can open the anniversary card in any of the offices of our bank. "Bank of Asia" - we support your steps!